On 30th January, students of SIMSREE were honored to have attended a conference with Hon. External Affairs Minister of India Smt. 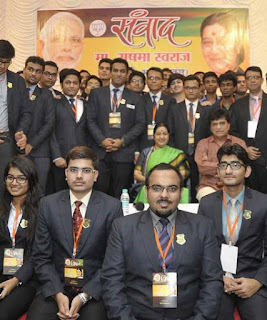 Sushma Swaraj. The event was held in Kalidas Natyamandir, Mulund (w). Students were gathered to place their grievances or their suggestions on any issue that needed to be addressed. The minister took her time and patiently answered various questions of all the young Indians gathered for the event. Students of SIMSREE also placed few suggestions as well questions forward and were pleased by the response they received from the Minister. Thank you so much for your date keep sharing. This information is impressive.Thanks for sharing!! This is a very important word to say thanks for sharing.